This class can get the incoming links to a site with Yahoo Site Explorer. It retrieve the Yahoo Site Explorer page for a given site and parses it to extract the URLs of links in other sites that point to the input site. The class returns an array with the domains of the pointing sites and the number of pages in those sites that have the links to the input site. 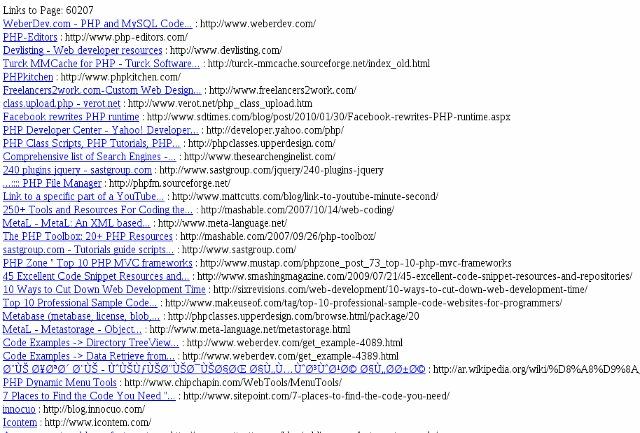 Number 10 Incoming links are links for a given page that exist in other pages or even other Web sites. The existence of incoming links can increase the rank of a given page. This class can find the incoming links to a given page that exist in other sites by using the Yahoo Site Explorer tool.